The most common way to water new plants is letting a garden hose trickle at the base of the plant, soaking the root ball. Also, you can use stationary sprinklers on low pressure and soaker hoses. If this is your preference, check to make sure enough water is applied to soak the rootball and surrounding soil. Once finished planting your new plant, water your plants thoroughly to ensure moisture in the immediate root ball and soil. Water thoroughly and deeply. Smaller plants may take 15-30 minutes and larger up 6o minutes. Soak it! Also, the next day water new plants again. Give the plant plenty of water! After the first 3 weeks of maintaining soil moisture, back off to watering deeply after allowing several days for the soils to dry a bit and then watering deeply again. Pay attention to how long it takes your soils to dry between watering. Follow-up watering will depend on the plant, size, season, soil type, and if it was container grown. The growing medium in a container grown plants is different and dries out quicker. For the first 3 weeks, keep the rootball evenly moist which may require watering every 3-4 days. After 3 weeks, make sure to allow time for it to dry out and breathe in between waterings. Typically, this would require watering around every 7 days for the first full season for larger root balls and in slightly less time in between watering for smaller rootballs. 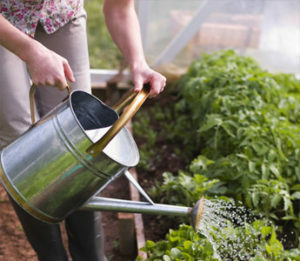 If the soil is not drying out and remains wet, back off the watering to allow more dry time. Always check each time before you water. If your leaves are wilting, your plant may be too wet or too dry. Physically and visually check to make sure water is needed by pulling the mulch aside to look at the soil and feel to check the moisture levels of both the root ball and soil. Smaller root balls and container grown plants require more frequent watering. Do not overwater your plants. You will not over water with a one-time soaking. You overwater when you water too often, and the soils stay consistently wet causing the roots not to breathe and root-rot sets in. Why are your plants getting too dry? Don’t ever assume showers and thunderstorms have thoroughly watered your plants. It helps to use a rain gauge. It takes several years for plants to become established. During droughts and dry spells, you will need additional watering. If your plant is growing next to or under a large tree, it will dry out quicker based on competition for soil moisture. In the summer, annuals, hanging baskets, potted plants, and groundcover may require daily or every other day watering. A solution is to use water grabbing polymers like Soil Moist, a product that is added to the soil to reduce watering needs. If you have more watering questions, ask our horticulturalist at questions@natorp.com.